1. Preheat the oven to 180°C, gas mark 4. Grease 6 x 175ml heatproof cups or dishes. Grate the orange zest and place in a food processor. Squeeze and measure the juice, making it up to 125ml with water if necessary. Add to the processor with the sultanas and carrots and blend until pulpy. 2. Beat together the butter and sugar until pale and creamy. Add the eggs and carrot mixture and beat well — it will look slightly curdled but don't worry. Sift in the flour and baking powder, tipping in the fibre left in the sieve, and fold in. Divide the mixture among the cups and place in a roasting tin. Pour a 1cm depth of boiling water around the cups and cover the roasting tin with foil, tucking it under the rim to trap the steam. 3. Carefully transfer to the oven and bake for 30 minutes until the puddings feel firm to the touch. Lift a corner of the foil, taking care as the steam will be hot, and test one of the puddings with a knife to see whether it’s cooked, before removing from the oven. 4. 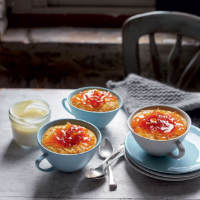 Heat the orange marmalade in a small saucepan with 1 tbsp water until thinned, then spoon over the top of the puddings. Delicious served with crème fraîche or yogurt. Instead of using heatproof cups or dishes, you can make these in individual metal pudding moulds then invert them onto serving plates before topping with the warm marmalade.